A CRITICALLY ACCLAIMED SUSPENSE NOVEL THAT READS LIKE YOU ARE VIEWING A VERY GOOD MOVIE. THE AUTHOR SPEAKS NOW ABOUT THIS NOVEL. 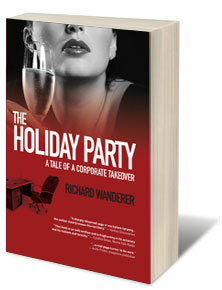 Spanning the cities of New York, Los Angeles and Washington, DC, THE HOLIDAY PARTY (A Tale of a Corporate Takeover) delivers an intriguing story. Defying the American Dream – “help your company become a profitable enterprise and you will be rewarded with a lifetime of security” – chaos occurs when employees find the company they helped to build and make profitable become the takeover target of a giant media conglomerate. Set in the world of glossy magazines and cross-country sales flights, THE HOLIDAY PARTY takes its readers deep into the world of corporate – and personal avarice and greed. Adam Gladstone, one of the heirs to GLADSTONE MAGAZINE, wants nothing but to see his father’s company thrive. Alongside his brother, Warren,they treat their employees like family. That is, until he has his fortune told at the magazine’s annual Christmas party. After that, nothing is ever the same and they confront the perils of the takeover. A high-powered media mogul with a dark secret. A publisher with the belief in the supernatural. An assistant who wants her boss’s job. An older employee who continues to bring great profits to his company – even after the takeover – suddenly finds he is fighting age discrimination. These are just a few of the players in THE HOLIDAY PARTY. When Daniel Davenport, a high ranking employee of the takeover company, wants something, nothing can stand in his way. He hides his monthly Wicca encounters – and his affair with Barbara Martinez Blessington, a fellow coven member and the woman he helps make publisher of GLADSTONE, from his wife. But when the voices in his head start calling for darker purposes, and his wife hires a private investigator, he finds himself taking one very wrong misstep on a rain-slicked fire escape. Tired of only being someone else’s right hand, Barbara Martinez Blessington helps Daniel with the takeover of GLADSTONE. Putting her brains, and her body to work for her proves to get her exactly what she wants: power, prestige and the trappings that come with it. But you can only hurt so many people before the backlash begins.